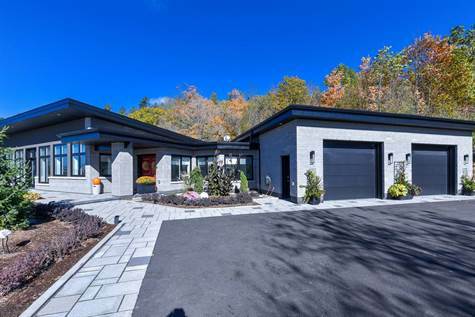 This newly built, luxurious bungalow with Smart House Technology, is truly one of a kind. Conveniently located on a private, nearly 2 acre lot, literally cut out of the Carp Ridge and boasting a spectacular view. Only minutes to Carp, Kanata, and the Canadian Tire Centre. Built with high quality materials including Insulated Concrete Foam (ICF). Huge oversized insulated garage (23.2' x 34.4' , storage area and cold storage. High ceilings, radiant heat, irrigation system, lanai, 2 gas fireplaces one of which is 2 sided are just a few of the many features. Paved driveway and professional landscaping package will be fully completed by mid July. This luxurious home comes fully furnished with all window treatments.